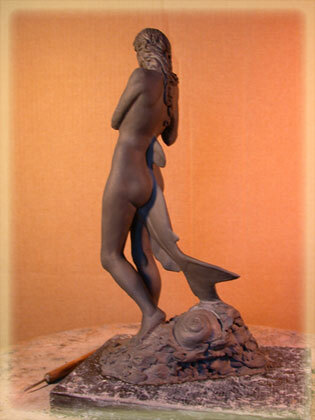 This is the working sculpture of "Thetis" - The Goddess, Catfish Girl, Mother of Achilles. This sculpture depicts the moment as Thetis, walking along the shoreline braiding her golden hair, watches for the omens. At this point in time, she does not realize that she is a Goddess or that her unborn child will be a son, Achilles. Otis' original poetry and new sculptures will be featured here. as we rebuild our site!